Heat oven to 350°F. 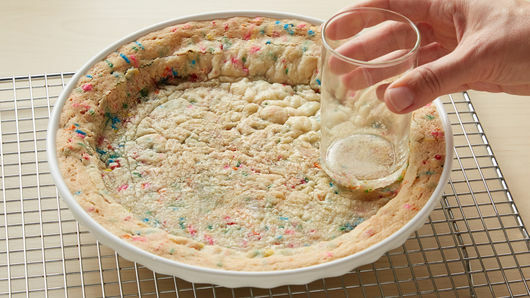 Spray 9-inch glass pie plate with cooking spray; lightly flour. In medium bowl, break up cookie dough. Stir in 1/4 cup of the candy sprinkles. Press dough evenly in bottom and up side of pie plate. Bake 15 to 19 minutes or until golden brown. Place pie plate on cooling rack. Using flat bottom of drinking glass, gently press center of crust to flatten slightly. Cool completely, about 1 hour 30 minutes. In large bowl, mix 1 3/4 cups of the whipping cream, the evaporated milk and salt. Beat with electric mixer on high speed 2 to 3 minutes or until mixture thickens. On low speed, slowly add sweetened condensed milk and vanilla; beat on high speed 3 to 4 minutes or until soft peaks form. Fold in 1/4 cup of the candy sprinkles. Pour whipped cream mixture over cookie crust in pie plate; spread evenly. In small bowl, using clean beaters, beat remaining 1/2 cup whipping cream and the powdered sugar with electric mixer on high speed until stiff peaks form. Place whipped cream mixture in decorating bag fitted with star tip. Pipe whipped cream decoratively around edges and in center of pie. 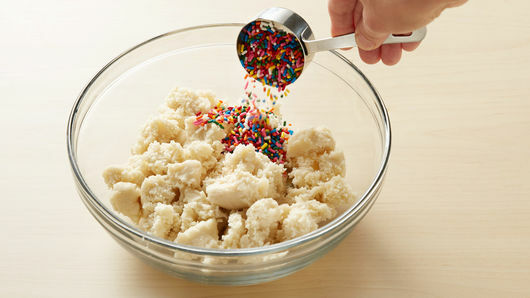 Sprinkle with remaining 1 tablespoon candy sprinkles. Freeze at least 8 hours or overnight. Remove from freezer 20 to 30 minutes before serving. To serve, cut into wedges. Store pie covered in freezer. 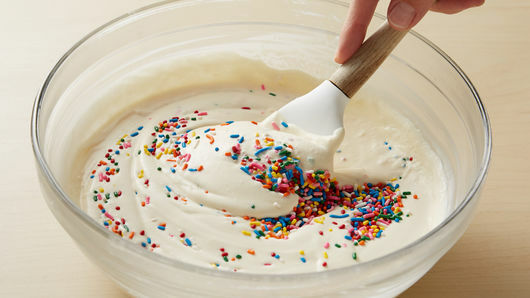 This recipe calls for multi-colored sprinkles for a birthday cake theme, but you can use any color sprinkles you want. Try red and green for Christmas or red, white and blue for Fourth of July! When you’re ready to serve the pie, use a hot knife to make clean slices. Run your knife under hot water and wipe it dry with a paper towel before making a cut. Every month, I host a Sunday dinner for my family to ensure we all see each other on a regular basis. If it’s the birthday month of an attendee, we will celebrate their birthday on that day. I have been making my own ice cream for over five years now, and lately have been experimenting with different and fun ways of serving it. 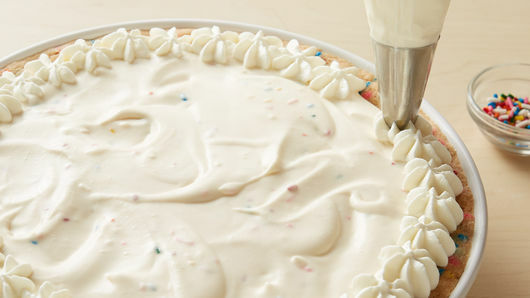 I thought of this recipe for Birthday Party Ice Cream Pie to serve during one of my nephew's birthdays because I thought it would be fun for the kids. Now, the adults are even requesting it as their birthday dessert, too! 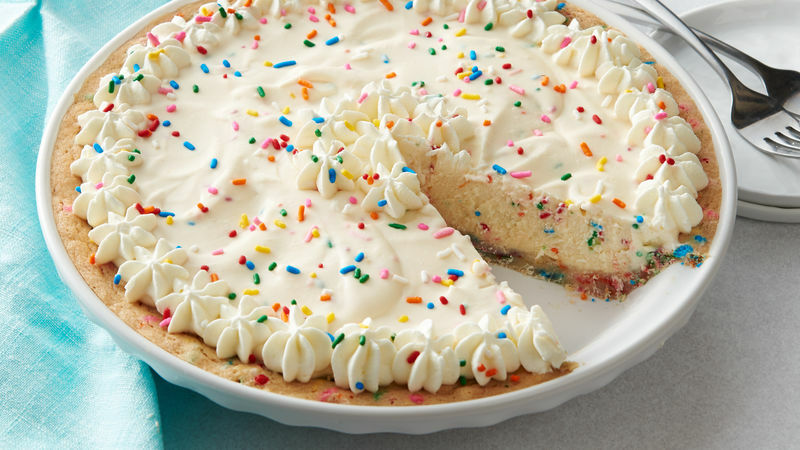 Preparation is extra easy with the quick cookie crust. I just jazz it up a little bit with confetti sprinkles. The ice cream filling makes it extra special. Now we have cookies and ice cream all in one simple dessert! It is really festive and is a special birthday dessert that everyone certainly enjoys.